Bare statistics cannot always give an insight into sporting performances, but just take a look at this. Anthony Ricketts has been on court for 255 minutes of play during this week's ISS Canary Wharf Squash Classic; his opponent Thierry Lincou for just 114. Ricketts has battled his way past Simon Parke, Gregory Gaultier and Karim Darwish in three massive, marathon encounters which all went the full distance. Lincou, on the other hand, has enjoyed a more comfortable passage to the final, removing Peter Barker, Alex Gough and Peter Nicol for the loss of just one game, against Barker. On the face of it you would have to back the fresher, fitter Lincou against an opponent who must surely be feeling he effects of such intense physical punishment. However, Ricketts is one of the toughest guys on the world tour and will be giving it one final push at adding the Canary Wharf title to his impressively expanding PSA honours list. Lincou will no doubt be trying to work him hard and take advantage of any signs of fatigue, as he did so effectively against Peter Nicol last night. Ricketts admitted he was extremely fortunate to get past Gaultier in the quarter-finals and should have wrapped up victory against Darwish in a quicker time than he managed after winning the second and third games in comfortable style. His loss of concentration meant that he was on court for an extra game and let's hope that he has sufficient energy to contest a final of the quality expected from our top two seeds. I am sure we will not be disappointed. Marathon man Anthony Ricketts once again demonstrated his awesome powers of resilience to beat Egypt's Karim Darwish to reach the final of the ISS Canary Wharf Squash Classic. Australian top seed Ricketts won his third consecutive five-game battle, this time winning 9-11, 11-4, 11-5, 1-11, 11-6 in 78 minutes. encounters at the packed East Wintergarden venue at Canary Wharf. However, after losing a tight opening game he looked to be in a hurry to finish matters as he powered through the second and third games. He admitted that he lost concentration in the fourth and quickly lost it 11-1, but came out all guns blazing to open up a solid lead in the fifth before an enforced break for treatment to a cut knee. After a long delay to stop the bleeding, world No.4 Ricketts was straight back into the groove to clinch a place in the final for a second year running. Thierry Lincou beat Peter Nicol 11-9 to destroy co-promoter Nicol’s hopes of winning his own tournament. With a career head-to-head record of 10-1 in Nicol’s favour before this match, the London crowd were hoping for a home victory, but Lincou’s controlled, stylish performance silenced their cheers. Nicol fought back from 5-2 down to lead 8-7 in the opening game, but a succession of loose rallies from the left-hander allowed Lincou to finish emphatically. Nicol seemed to have settled in the second game and after leading 9-6 he weathered a revival by the Frenchman to hold game ball at 10-9 and11-10. But once again his loose shots were punished ruthlessly by his opponent, who won the tiebreak 2-0. 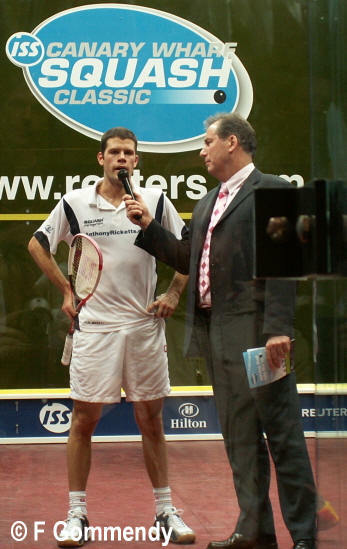 Nicol was chasing for most of the third game, and the crowd were willing him to extend the match, but despite closing a three-point deficit three times to 4-5, 6-7, and then 9-10, he could not prevent Lincou’s accurate placement from clinching a berth in the Canary Wharf final for a second time. After the way he dealt with Nicol’s attack and subdued a partisan home crowd, Lincou will be hoping to continue his excellent form against an opponent who could well be in line for another extended stay on the glass court. Lovely words for event promoters to hear. 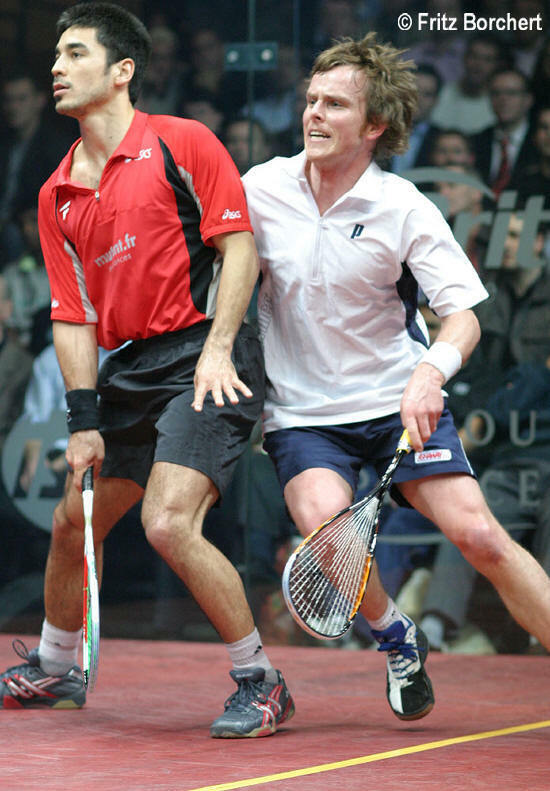 Creating a demand for top-level squash is just one of the ambitions of Tim, Peter, Angus and myself, and it was very gratifying to achieve that goal here at Canary Wharf. It's always nice to receive compliments, and we are grateful for the many spectators who have had nice things to say about the set-up at the East Wintergarden this year. The new seating configuration, supplied by Arena, looks extremely professional and the colours match the court frame. The scoreboards and plasma screens provided by Horizon, who are producing the live internet streaming on PSALive.com, have also drawn nothing but praise. Once again Chelsea Catering are laying on superb cuisine in the Gallery Restaurant, and the introduction of the extra standing area in the Gallery Bar has proved extremely popular. We also have extra little touches, like a beam shining the ISS logo on the screen above the Gallery, and the advertising on the open-air screen provided by Reuters, our new Associate Sponsors, outside their nearby headquarters. With all the input of Canary Wharf's Arts and Events team, who have been phenomenally supportive in every facet of the tournament's development, we have a great team in place. We have just a few tickets left for tonight's semi-finals and tomorrow's final, and what a splendid pair of matches we have this evening: Ricketts v Darwish and Nicol v Lincou. Just like last night's programme, tonight's schedule can be summed up in one word: quality. Whether you are here at the venue or tuning in live on the internet, we look forward to you joining us later. First up at 5.30pm, Pontefract star James Willstrop meets Egypt's Karim Darwish in a mouthwatering clash of two former world junior champions. These two players have shared their recent matches with two wins apiece and Willstrop acknowledges that he will have to play much better than he did last night against Shahid Zaman to beat his Egyptian rival. Next up is an all-England clash between former world champion Peter Nicol and his national team-mate Lee Beachill, from Yorkshire. This is a clash of the US Open Champion against the English Open Champion and it will be interesting to see how both players have recovered from their exertions in Manchester last week, particularly Beachill. These two Englishmen are guaranteed to give us top class entertainment today. Beachill has won three out of the past four meetings but Nicol leads their career head to head series 9-4. 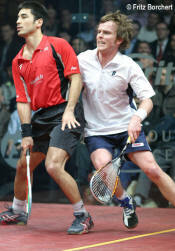 Both players, of course, were members of the England team who won the World Team Title against Egypt in December. 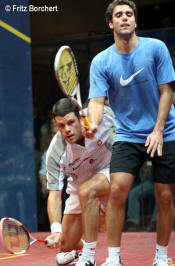 Top seed Anthony Ricketts of Australia faces a potentially explosive clash with French ace Gregory Gaultier. 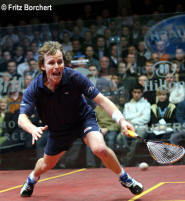 This match brings together the TOC and British Open Champion Ricketts and the new French national champion Gaultier. Gaultier comes to this match having just beaten Thierry Lincou to take the French National title and is now gunning to improve his PSA ranking. Both players play a very attacking, sometimes physical style of squash and fireworks are expected at Canary Wharf tonight. national final, meets Welsh outsider Alex Gough, who beat the new British champion Nick Matthew in Monday's first round. scalp to his collection tonight. Squash is a brutal game. And James Willstrop was being brutally honest when he analysed his performance against Shahid Zaman tonight in the first round of the ISS Canary Wharf Squash Classic. "I can honestly, and categorically state that was the worst squash I have ever played in my life, and I am sure that Shahid would agree," he admitted after scraping his way through a scrappy encounter to set up a quarter-final against Egypt's Karim Darwish. Willstrop was sluggish in his movement, and was unable to produce the kind of flowing squash we have come to expect from this hugely talented 22-year-old. The reason for his abject performance was simple. Along with fellow Yorkshiremen Lee Beachill and Nick Matthew, he was still feeling the effects of the closing stages of the National Championships in Manchester at the weekend. He added: "I had a massive match with Lee on Saturday and I am still feeling shattered from that, so God knows how Lee must be feeling after playing a marathon final against Nick on the Sunday. "I am very, very pleased and relieved to get that one out of the way and try to focus on getting my game back together in the next 24 hours." Darwish will probably not be so forgiving as Zaman, who almost took the third game and had two game balls in a protracted tiebreak that went to 16-14. Earlier, Beachill had enough in the tank to cruise past Ben Garner, although the Surrey player held a solid lead in the opening game and came close to taking it. "Ben played really well and I was worried that he might take that first game. 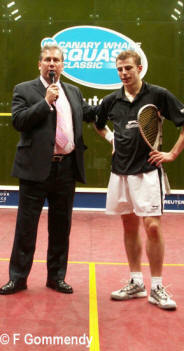 I am relieved to get that one over with but meeting Peter Nicol in the quarter-finals is a different prospect. "I know he's knocking on a bit now, but on his day, when he puts it all together, Peter can still beat anybody in the world, so I know I will have to raise my game." Finals days are always a mixture of emotions: anticipation as you look forward to the concluding match of a great tournament, but tinged with sadness that, after months of planning and hard work, it will all soon be over. Every year brings a happy reunion of familiar faces and the coming together of friends and foes recalling battles on squash courts all over the world. Catching up on the news over a glass of mineral water, or occasionally something stronger, is part of the late-night pattern at the tournament hotel as we all unwind at the end of the day. It is always great to hear of new clubs and new tournaments, and I look forward to seeing the new squash centre being built in Oslo, Norway's beautiful capital.